James J. Schwartz (born June 2, 1966) is an American football coach who is the defensive coordinator of the Philadelphia Eagles of the National Football League (NFL). Schwartz was also formerly the head coach of the NFL's Detroit Lions. As a defensive-minded coach that emphasized strong defensive line play, Schwartz was known to build his units around a dominant interior lineman. Each of his stints as head coach or defensive coordinator resulted in one of his defensive tackles being named to the Pro Bowl or All-Pro First Team, including Albert Haynesworth, Ndamukong Suh, Marcell Dareus and Fletcher Cox. Schwartz was born just outside Baltimore, Maryland, and attended Mount Saint Joseph High School, an all-male Catholic school, where he played football. Schwartz was a four-year letterman at linebacker for the Hoyas of Georgetown University, where he earned his degree in economics. He received Distinguished Economics Graduate honors at Georgetown and earned numerous honors in 1988, including Division III CoSIDA/GTE Academic All-America, All-America, and team captain. Schwartz got his start in the NFL doing research for Bill Belichick on the Cleveland Browns staff in the mid-1990s. Schwartz served as the Tennessee Titans' defensive coordinator from 2001–2008. During his time with Tennessee, Schwartz was considered for several different NFL head coaching openings. He was a candidate for the San Francisco 49ers' head coaching position in 2005, but the job went to Mike Nolan. In January 2008, he interviewed for head coaching positions with the Washington Redskins, Miami Dolphins and Atlanta Falcons. Adam Schefter reported on January 15, 2009 that the Detroit Lions had decided to hire Schwartz as head coach. Defensive tackle Albert Haynesworth, who Schwartz led to stardom, would later call the coach a "mastermind" due to the success he found in his defensive schemes. The 2009 season was Schwartz's first as Detroit's head coach and he posted a 2–14 record, with victories coming against the Washington Redskins and the Cleveland Browns. In 2010, Schwartz saw his Lions begin the season with a 2–10 record, but they finished with four consecutive wins against the Green Bay Packers, Tampa Bay Buccaneers, Miami Dolphins, and Minnesota Vikings. In 2011, the Lions returned to the postseason for the first time since 1999, clinching a playoff berth following a 38–10 victory over the San Diego Chargers. Detroit would go on to be eliminated in the first round by the New Orleans Saints. The Lions started the 2012 season with a 4–4 record, but they then dropped their final eight games to end the year at 4–12. They finished in last place in the NFC North, as every other division member won at least ten games. Following the season, Schwartz and his staff led the South Team to a 21–16 triumph in the 2013 Senior Bowl. The Lions started the 2013 season with a 6–3 record and gained control of the NFC North, the Lions proceeded to drop six of their next seven games to end the year at 7–9. Schwartz was fired on December 30, 2013, following five seasons as head coach. On January 24, 2014, Schwartz was hired by the Buffalo Bills as the defensive coordinator. In 2014 Schwartz's defense was one of the top defenses statistically in the NFL, and led the league in sacks. During the 2014 season, the Bills went 4–0 against NFC North opponents, which Schwartz had coached against for the previous five seasons. On October 5, 2014, the Bills defeated Schwartz's former team, the Detroit Lions, by a final score of 17–14, in Detroit. Schwartz was carried off the field by his players after the game. Some Lions players, especially Golden Tate, were upset by Schwartz's decision to be carried off the field against his former team. The Bills ended the season fourth in the NFL in points and yards allowed per game with 18.1 and 312.2, respectively, while ranking third in takeaways with 30. The Bills also finished with their first winning record in ten years at 9–7, with defensive linemen Kyle Williams, Marcell Dareus and Mario Williams being named to the Pro Bowl and the latter two being named First-Team All-Pro. Despite the success, head coach Doug Marrone resigned at the end of the season and new Bills coach Rex Ryan decided to bring in his own personnel, rather than retaining Schwartz. For the 2015 season, Schwartz took a consulting position with the NFL's officiating department to provide a coach's perspective on officiating decisions. On October 6, Schwartz declined the opportunity to replace Miami Dolphins defensive coordinator Kevin Coyle. On January 19, 2016, Schwartz was hired by the Philadelphia Eagles to be their defensive coordinator under coach Doug Pederson. Inheriting one of the league's worst defenses, Schwartz made an immediate impact. Implementing his 4-3 defense, Schwartz turned around the defense that previously ranked 30th in yards allowed and 28th in points allowed to 13th and 12th in his first season and fourth in both categories during his second. He would eventually lead the defense to his and the Eagles' first Super Bowl championship in Super Bowl LII. Schwartz and his wife, Kathy, have twins Christian and Alison, along with a younger daughter, Maria. ^ Barnwell, Bill (June 22, 2016). "Ranking the NFL's defensive triplets from 32-1". 'ESPN'. Retrieved September 24, 2018. ^ Zaroo, Philip (July 31, 2009). 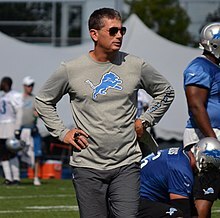 "Confident, comfortable Jim Schwartz ready to lead resurgence of Detroit Lions". Michigan Live. MLive Media Group. Retrieved March 17, 2018. ^ "Detroit Lions: Jim Schwartz". detroitlions.com. Retrieved January 4, 2013. ^ Maske, Mark (January 18, 2005). "49ers Select Ravens' Nolan as Head Coach". Washington Post. Retrieved January 4, 2013. ^ "Redskins begin interviews with Titans' Schwartz". ESPN.com. Retrieved January 4, 2013. ^ "Of four candidates, Cowboys' Sparano out front for Dolphins job". ESPN.com. Retrieved January 4, 2013. ^ "Schwartz meets with Falcons, prepares to meet with Fins". ESPN.com. Retrieved January 4, 2013. ^ Haynesworth, Albert (July 6, 2015). "Letter to My Younger Self". The Players' Tribune. Retrieved September 24, 2018. ^ 2009 Detroit Lions. Pro-Football Reference.com. Retrieved September 21, 2012. ^ 2010 Detroit Lions. Pro-Football Reference.com. Retrieved September 21, 2012. ^ Mordowanec, Nick. "Fan Take: Detroit Lions Make Playoffs for First Time Since 1999". Yahoo! Sports.com. Retrieved October 25, 2012. ^ 2011 Detroit Lions. Pro Football-Reference.com. Retrieved October 25, 2012. ^ 2012 Detroit Lions. Pro-Football Reference.com. Retrieved January 4, 2013. ^ 2012 NFL Standings, Team & Offensive Statistics. Pro-Football Reference.com. Retrieved January 4, 2013. ^ Twentyman, Tim (January 26, 2013). "Jim Schwartz's South Team squad wins Senior Bowl 21-16". detroitlions.com. Retrieved March 11, 2013. ^ Patra, Kevin (December 30, 2013). "Jim Schwartz fired by Detroit Lions after five seasons". National Football League. Retrieved December 30, 2013. ^ "2014 NFL regular-season statistics for team defenses (sorted by number of sacks)". NFL.com. ^ "Dan Carpenter hits 58-yard field goal for Bills to beat Lions". ESPN.com. Associated Press. October 5, 2014. ^ Brinson, Will (October 8, 2014). "Golden Tate: Jim Schwartz asking to get carried off 'disrespectful'". CBSSports.com. ^ Krinch, Scott (December 29, 2014). "11 candidates to replace Marc Trestman as new Bears head coach". Comcast SportsNet Chicago. Archived from the original on December 31, 2014. Retrieved December 29, 2014. ^ Galliford, Brian (December 23, 2014). "2015 NFL Pro Bowl rosters: Buffalo Bills send three defensive linemen". SBNation.com. ^ Fairburn, Matthew (January 13, 2015). "Buffalo Bills officially fire Jim Schwartz, hire Greg Roman as offensive coordinator". Syracuse.com. ^ Hanzus, Dan (May 25, 2015). "Jim Schwartz takes job working with NFL officials". NFL.com. ^ Wagner-McGough, Sean (October 6, 2015). "Report: Jim Schwartz declines offer to be Dolphins' defensive coordinator". CBSSports.com. ^ Patra, Kevin (January 19, 2016). "Eagles hire Jim Schwartz as defensive coordinator". NFL.com. ^ Maaddi, Rob (January 24, 2018). "Jim Schwartz turns Eagles' 'D' into one of NFL's best". USAToday.com. ^ "Eagles dethrone Tom Brady, Patriots for first Super Bowl title in stunner". USA TODAY. Retrieved February 25, 2019.